Syracuse coach Jim Boeheim from the sidelines. Photo Credit: Brad Penner/USA Today Sports Images. With the start of basketball practice on the horizon and Dino Babers making speeches like he’s running for office, let’s take a look at how recruiting efforts by both squads have gone of late. Despite having only Brycen Goodine committed, Jim Boeheim and his staff have been busy making additional inroads on other 2019 targets. Kai Jones, a 6-foot-10 senior at Brewster Academy, officially visited Syracuse this past weekend. The 4-star recruit also has offers from Florida State, Arizona, Stanford, Vanderbilt, Iowa State, and Oregon. Syracuse coaches traveled to Indiana last week to see Isaiah Stewart, a 5-star recruit and one of the most sought after players in the country. Formerly of Rochester, Stewart now attends school at La Lumiere. The staff paid a visit to Akok Akok recently at his school, Putnam Science Academy. Standing at 6-foot-10, Akok is the type of power forward who tends to excel in Syracuse’s system. Former Big east foes Providence and UConn are threats to land Akok’s services. Another front court player who recently visited Syracuse is 6-foot-10 Qudus Wahab out of the Flint Hill School in Oakton, VA. A 3-star recruit, Wahab is also looking at Ohio State, UConn, Pittsburgh, Georgetown, and Louisville, among others. Looking at the Class of 2020, Syracuse recently offered local product Symir Torrence. The 6-foot-3 guard plays at Vermont Academy and is ranked four stars. He also has offers from Butler, Cincinnati, Northwestern, and Vanderbilt. One way to attract recruits is by kicking the tar out of the most well-known program in the country. You might’ve heard that Syracuse did exactly that last Saturday when Florida State came to town. Beating the best of the best, even if they are down, is also a good way to keep recruits committed to your program. Cornelius Nunn, Jr., the highest ranked player in Syracuse’s 2019 class, was at the Carrier Dome to watch his future team dismantle the Seminoles. Despite being an Orange commit, there are those who think Nunn will wind up a Hurricane. Playing the way it did against FSU only strengthens Syracuse’s ability to attract, and keep, players like Nunn. It shouldn’t be long until recruiting efforts by both programs pay off in the form of their next commit. 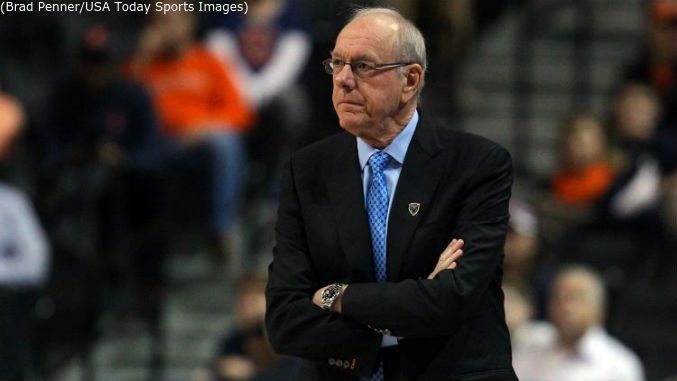 October tends to be Boeheim’s best month for land players. And Babers can pass the time by giving speeches. The fans certainly won’t mind.